Pictured here is the basket the Library contributed to the Health Promotion’s 16th Annual Basket fundraiser at the Campus Activity Team’s (CAT’s) Holiday Bazaar. Donations will give attendees the opportunity to win baskets sponsored by the Library and other campus offices. Proceeds will purchase gifts for families through Delaware County’s Children & Youth Services. The CAT’s Bazaar will be held in the Connelly Center Villanova Room on Thursday, Nov. 29, from 10 a.m. to 6 p.m. and on Friday, Nov. 30, from 10 a.m. to 5 p.m. 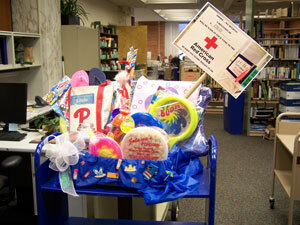 The library basket includes a donation of $250 to the Red Cross’s Hurricane Sandy relief fund. The Falvey University Staff Council team created the basket using the generous donations from the library staff. Falvey USC team volunteers are William Greene, Gina Duffy, Becky Whidden, Marie Roman, Margaret Duffy, Jeannine Ahern, Joanne Quinn, Mary Heyman, Linda Hauck (incoming chair) and Phylis Wright (current chair). The basket looks great at the bazaar!